In Javanese wayang kulit, a puppeteer-narrator (dalang) is responsible for a performance that lasts all night (from 9pm to 4am). The stories are delivered in Javanese in a mixture of dialogue, narration and sung poetry which is accompanied by gamelan music and by a chorus of female singers (pesinden). The stories are usually taken from the Sanskrit epics, the Mahabharata and the Ramayana and each wayang show only focuses on a small episode of the epic. Although the stories are originally Indian, the wayang kulit versions are distinctly Javanese. The clown servants (punokawan) are one example of uniquely Javanese addition to the stories. Semar and his sons (Petruk, Gareng and Bagong) offer advice to the protagonists, and comic relief for the spectators during a comic scene that is one of the most popular parts of the performance. In wayang kulit, the dalang holds the puppets in front of a light, casting their shadows on a screen. Although the show can be seen from the side of the shadows, the audience usually watches from the dalang's side. Ward Keeler. 1987. Javanese Shadow Plays, Javanese Selves. Princeton: Princeton University Press. Willem Huibert Rassers. 1959. Panji, the Culture Hero: A Structured Study of Religion in Java. The Hague: M. Nijhoff. Victoria Clara van Groenendael. 1985. The Dalang Behind the Wayang: The Role of the Surakarta and the Yogyakarta Dalang in Indonesian-Javanese Society. Dordrecht: Floris Publications. Roger Long. 1986. Javanese Shadow Theatre: Movement and Characterization in Ngayogyakarta Wayang Kulit. Ann Arbor: UMI Research Press. Mrázek, Jan. 2005. 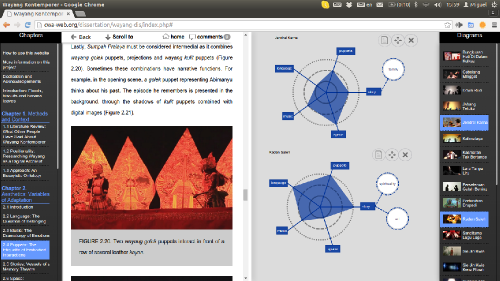 Phenomenology of a Puppet Theatre: Contemplations on the Art of Javanese Wayang Kulit. Leiden: KITLV Press. Purbo Asmoro. 2013. Makutharama [Rama's Crown]: Text of A Wayang Kulit Tale, Performed in Three Dramatic Styles. Transcriptions of live performances by Purbo Asmoro; translated from the Javanese by Kathryn Emerson. Jakarta: Lontar. Purbo Asmoro. 2013. Sesaji Raja Suya [The grand offering of the kings]: Text of A Wayang Kulit Tale, Performed in Three Dramatic Styles. Transcriptions of live performances by Purbo Asmoro; translated from the Javanese by Kathryn Emerson. Jakarta: Lontar. Purbo Asmoro. 2014. Makutharama [Rama’s Crown]: A Central Javanese Wayang Kulit Performance in Palace Classical, Contemporary-interpretive, and Condensed Styles. DVD with English and Indonesian subtitles, a menu of liner notes, and accompanying volumes of text. Jakarta: Lontar Press (PAL)/Burlington: Multicultural Media (NTSC). Purbo Asmoro. 2014. Sesaji Raja Suya [The Grand Offering of the Kings]: A Central Javanese Wayang Kulit Performance in Palace Classical, Contemporary-interpretive, and Condensed Styles. DVD with English and Indonesian subtitles, a menu of liner notes, and accompanying volumes of text. Jakarta: Lontar Press (PAL)/Burlington: Multicultural Media (NTSC). Kathryn Emerson. 2016. Transforming Wayang for Contemporary Audiences: Dramatic Expression in Purbo Asmoro's Style, 1989–2015. Doctoral Thesis. Leiden University. Bernard Arps. 2016. Tall Tree, Nest of the Wind: The Javanese Shadow-play Dewa Ruci Performed by Ki Anom Soeroto - A Study in Performance Philology. Singapore: NUS Press. 1)The dalang is the central figure. Many theatre performances use wayang conventions but don't include a puppeteer-narrator. These performances were not considered for the archive. 2) Javanese wayang kulit conventions are used. The shows included here should include at least one convention regarding to the music, stories, puppets, language or performance spaces of Javanese wayang. Balinese and Malaysian versions of wayang were not included. 3) The performances were created and recorded in the 21st century in Java. The archive does not include contemporary versions of wayang in other media (films, artworks or novels), nor does it include contemporary shows that were created in other countries in earlier times. Jan Mrázek, ed., 2002. Puppet Theater in Contemporary Indonesia: New Approaches to Performance Events. Ann Arbor, MI: University of Michigan, Centers for South and Southeast Asian Studies. Matthew Isaac Cohen. 2007. "Contemporary Wayang in Global Contexts." Asian Theatre Journal 24.7: 338-369. Tim Behrend. 1999. "The Millenail esc(h)atology of Heri Dono: 'Semar Farts' First in Auckland, New Zealand." Indonesia and The Malay Word 27.9: 208-224. Matthew Isaac Cohen. 2014. "Traditional and Post-Traditional Wayang Kulit in Java Today." In D. Posner, J. Bell, & C. Orenstein (Eds. ), The Routledge Companion to Puppetry and Material Performance, pp. 178-191. Abindgdon: Routledge. Miguel Escobar Varela. 2014. "Wayang Hip Hop: Java's Oldest Performance Tradition Meets Global Youth Culture." Asian Theatre Journal 31.1: 481-504. Miguel Escobar Varela. 2016. "Heirlooms of the Everyday: The Material Performances of Slamet Gundono." Theatre Research International 41.1: 53-69. Matthew Isaac Cohen. 2017. "Global Modernities and Post-Traditional Shadow Puppetry in Contemporary Southeast Asia." Third Text 31: 1-19.